2/14 is valentine day as everyone know, honestly I didn't celebrate it officially with my baby cz he is sick. T.T almost like a week, then I started suspect was it dengue or what. But luckily is not, just normal fever. Just now my baby suddenly come out a question while he was watching drama on my bed, " bie , r u feel my present for u is too cheap? How come u nv post in Instagram as everyone did on 2/14?" Hahaha I'm feel like my baby is toooooo cute. Actually I was taking the ipad and be prepare to take pic on the present at the same time when he asking me that ques. I was actually too busy in these few days cz need to take care of him. See!!!!!! See what he gave to me when valentine!!!!! A mini rubbish bin, this is why he feels that I won't post it on insta!!! And he still say " nvm la, the cartoon on the bin just like u, so cute" == 😒😒😒😒😒😒, do u think I will happy ? The reason he gv me this is Becoz I nv keep my rom clean, so he 用心良苦 bought me a rubbish bin to remind me must keep my room tidy and clean. Not romantic at all.....haiz but still forgv him since he bought me a chocolate bar which is my fave flavor. Although no flowers but I don mind ( cz I personally think not worth to buy flowers on that day, no offense) , I still happy that u rmb to buy something for me even though u are not feeling well on that day and following days. I love you as always. Hello everyone, now is the mid of Cny, most of the people back to work including myself. I start work on chu 4, so pathetic. Totally lost my working mood u know. But then I had watched a great local movie call 一路有你. I think is a quite nice and meaningful movie talking bout two generation people have different perspective on marriage and having a family. Go watch with my sista and bf on chu 2 night in mid valley. 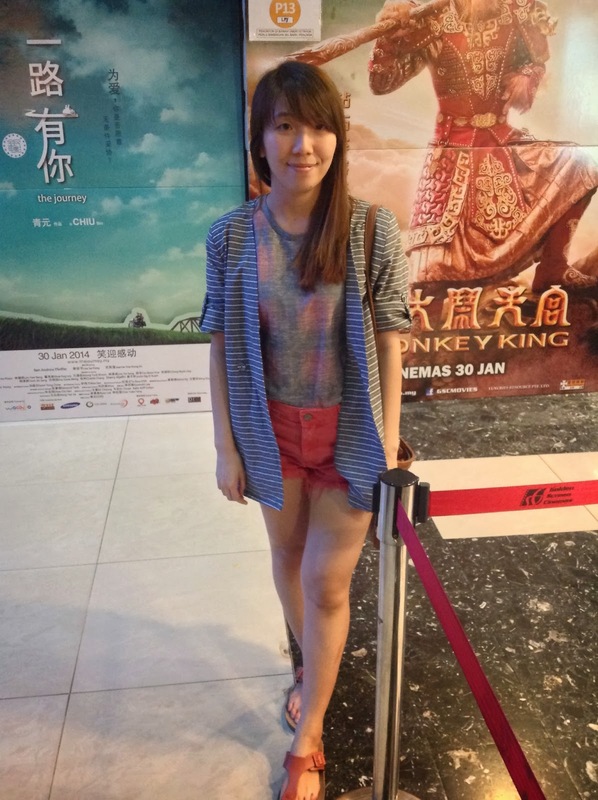 This is my ootd, lol I force my boy to take this pic for me and it's quite paishe, mid valley cinema is CROWED on that day. And my sista had give birth about 3 and half months ago, got a baby boy. Damn cute!!! I always pinch and bite him when I see him. It's too CUTE!! Me and baby boy. Cute right??? Hope he can grow up happily and healthy.